On 29-30 September, 2015 were held in Tunis the training sessions “Financial instruments for distributed solar energy technologies”, organised by the Italian Ministry for the Environment, Land and Sea (IMELS) and Studiare Sviluppo in collaboration with the Tunisian National Agency for Energy Conservation (ANME). Over 25 participants among economical operators, public administration officers, suppliers, banks and financial institutes took part to the training sessions. During the first day, Italian and local Med-Desire experts analysed the Tunisian energy and finance context, discussed about renewable energies, financial mechanisms, presented best practices. ENEA – the Italian National Agency for New Technologies, Energy and Sustainable Economic Development reported the Italian experience on financial schemes to support renewable energy and energy efficiency. On the second day the training focused specifically on technical and operative aspects such as business models, financing needs, risks assessment, financing structure. 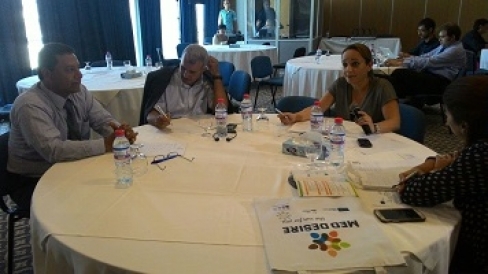 Participants were divided in working groups in order to discuss about “risks assessment” of a mid size PV plant in Tunisia. This led to the opening of an interesting exchange of information, opinions, experiences and technical knowledge among the participants. In the afternoon, the successful IRES company case was examined, giving to the audience the business perspective in the renewable energy sector. “Financial instruments for distributed solar energy technologies” is part of the Med-Desire training sessions promoted by IMELS and Studiare Sviluppo which will take place in Tunisia, Lebanon and Egypt in collaboration with the Tunisian National Agency for Energy Conservation (ANME), the Lebanese Center for Energy Conservation (LCEC) and the Egyptian New and Renewable Energy Authority (NREA), within the Project MED-DESIRE, to increase energy efficiency and distributed solar energy technology in the Mediterranean Partner Countries. Next training sessions will be held in Hammam-Sousse on 20-21 October, 2015 dealing with innovative regulatory instruments for renewable energy market support, namely Solar Ordinances.